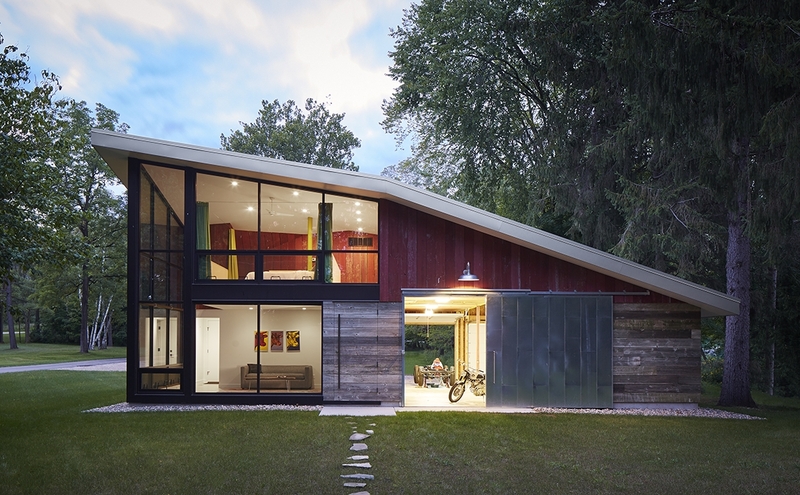 A 47-foot wide by 49-foot long simple rectangular building, conforming to the multi-use zoning of the site, is built out of century–old reclaimed barn wood siding, raw with its fading original paint, a commercial window wall, and an aluminum standing-seam roof that segues from a symmetrical gable into a playfully truncated, half-butterfly form. The building is sited at the ingress of a long, narrow lot. Its utility functions are sited at its ‘back’ gabled end away from the main house, while the guest quarters are situated in the front with views of the lake. A screen wall, (an extension of the building) also clad in reclaimed barn wood, conceals parked vehicles. The rear façade is punctuated with four doors, three of which are sectional garage doors (one fenestrated to illuminate the Shop). Inside, the utility area doubles as Garage and event space, spanning the length of the structure. It culminates with another garage door allowing vehicles with trailers to pull through rather than having to back out (a particularly awkward movement). The space opposite the Garage is split into a Shop and a 13.5-foot x 15-foot Lounge area that serves as a guesthouse at the front. The roof rises 8-feet over this living area leaving room to tuck a 10.5-foot x 13.5-foot sleeping loft under its asymmetrical roof. Constructed from local, re-claimed and readily available materials and being less than 2,200 square feet in size, this budget friendly, multi-purpose building is functional, straightforward, and site-sensitive, making it successfully innovative while at the same time, sustainable.